A long-rumored Space Vision from the White House did materialize on January 14, 2004, with President Bush's announcement of a critical turn in the US policy in space. NASA was ordered to prepare for the return of US astronauts to the Moon and for the establishment of a base there, which could serve as a launching point for the expedition to Mars. However, unlike similar proposals in the past, the effort would be conducted at the expense of the Space Shuttle program and the US involvement in the International Space Station. In the immediate aftermath of the announcement, the Bush space plan generated considerable criticism and ridicule in the US media and among general public. However the Bush administration, and the Republican leadership in the US Congress continued bulldozing the program, promptly renamed "Vision for Space Exploration" through the resistance of fiscal conservatives within its own party. On November 2, 2004, President Bush, won a second term in office, essentially insuring the survival of the program for at least four more years. Within weeks, NASA Administrator Sean O'Keefe, who was originally appointed by the Bush Administration to fix the agency's financial policies, resigned from his post. In the immediate aftermath of the January 2004 decision, observers spelled out several reasons for retiring the Shuttle. The Columbia tragedy only few months earlier was cited as the primary reason. In fact, the fate of the worlds first reusable transportation system was essentially sealed almost 18 years earlier, on January 28, 1986, when the Space Shuttle Challenger exploded in the skies over the Atlantic. The first Shuttle tragedy shattered NASA hopes for establishing cheap and routine access to the Earth orbit to fulfill a multitude of commercial, military and scientific goals. In the wake of the Challenger disaster, NASA abandoned plans for making the Shuttle an economically viable system, however committed to fund the program for the national goals. Heightened safety measures, reduced payload capabilities and slowed pace of launches turned the Shuttle into a white elephant, consuming a large chunk of the NASA budget. By the end of the 1990s, the International Space Station and Hubble Space Telescope remained the only programs, which required unique capabilities of the Shuttle for orbital assembly and servicing. Ever since the Challenger accident, observers have said that another tragedy would spell the end of the Shuttle. That tragedy did strike on February 1, 2003, as the Space Shuttle Columbia, damaged in the critical area of the wing during the launch, disintegrated as she was reentering the Earth atmosphere. In January 1984, President Ronald Reagan called for the creation of a permanent human outpost in the Earth orbit. A multi-billion-dollar project, which later evolved into the International Space Station, was advertised by NASA, as the next logical step in the human conquest of space, as a unique platform for scientific research and the ultimate high ground for international cooperation. However, from the outset, critics said that no science was justified by the price tag of the program, and that, in fact, much more efficient research could be accomplished onboard vibration-free unmanned spacecraft at a fraction of a cost of the space station. On top of the science debate, political problems were piling up. A Russian proverb says: "A child with seven nannies will end up without an eye." An unprecedented international nature of the project turned out to be its strength as well as its weakness. Although partners across the world had been able to pull together money, hardware and brains to accomplish the project, the station seemingly lacked national identity needed to energize political support among participating nations. The Cold War dinosaurs on both sides of the Atlantic tirelessly pummeled the project for its real and imaginary ills. In Russia, nationalists of all sorts, scolded the Russian space industry for becoming a "chauffeur" of the US space agency and sacrificing Russias Mir space station for the benefit of the US-controlled program. In the US, columnists and politicians criticized NASA for allowing Russians into the critical path in the program, for its astronomical cost overruns and for endless circling the globe in the aluminum Tinkertoy. To make matters worse, the partners in the ISS project kept bickering about rather trivial matters, such as allowing paying passengers to visit the station, thus poisoning the atmosphere around the project. Back on Earth, politics also dragged the program down. The US Congress essentially made Russian space industry a scapegoat of the Kremlins nuclear flirt with Iran, prohibiting NASA to purchase hardware and services from Moscow. Finally, European-Russian opposition to the US invasion of Iraq probably drove the last nail in the ISS coffin. 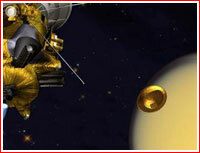 During 2004, unmanned planetary probes achieved breathtaking results, although often not fully appreciated by the media. On January 2, 2004, Stardust flew within 236 kilometers of Comet Wild 2 and captured thousands of particles in its aerogel collector for return on Earth in January 2006. Findings from a historic encounter between NASA's Stardust spacecraft and a comet have revealed a much stranger world than previously believed. Unmatched imagery and wealth of other scientific data, including convincing evidence of past salty seas, came from two NASA rovers, which successfully landed and survived harsh conditions on the surface of Mars. These information about Mars was complemented by two NASA probes and the European Mars Express orbiting the planet. In the meantime, Cassini spacecraft successfully entered orbit around Saturn and sent a European lander toward its mysterious moon Titan. 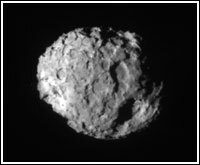 However, Russian planetary program remain essentially stalled with a lonely Phobos-Grunt project, still awaiting $25 million in federal funding and the launch date in 2009. Jan. 14: President George W. Bush announced the plan to resume manned exploration of the Moon in 2020, to retire the Shuttle in 2010 and end US involvement in the ISS program in 2016. Quietly prepared by the administration which previously displayed little interest in space program beyond cutting its budget, the new plan called for the most extensive revamp in the history of NASA. Jan. 15: NASA's Mars Exploration Rover Spirit successfully drove off its lander platform and onto the soil of Mars early today. The robot's first picture looking back at the now-empty lander and showing wheel tracks in the soil set off cheers from the robot's flight team at NASA's Jet Propulsion Laboratory, Pasadena, Calif.
Jan. 25: NASA Opportunity rover successfully landed on the surface of Mars. Jan. 31: NASA's Mars Exploration Rover Opportunity drove down a reinforced fabric ramp at the front of its lander platform and onto the soil of Mars' Meridiani Planum this morning. Feb. 1: NASA's Mars Exploration Rover Spirit is healthy again, the result of recovery work by mission engineers since the robot developed computer-memory and communications problems 10 days ago. Feb.: An explosion and fire in the Indian space center kills six people. Feb. 17: Yuri Koptev, Director General of the Russian Aviation & Space Agency, releases plans to develop a reusable Kliper spacecraft capable of replacing the Soyuz. 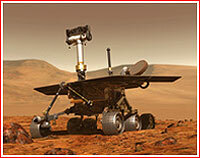 March 2: NASA announced at a special press conference at the agency's headquarters in Washington DC that its scientists have concluded the part of Mars that NASA's Opportunity rover is exploring was soaking wet in the past. March 27: NASA's second X-43A hypersonic research aircraft flew successfully today, the first time an air-breathing scramjet powered aircraft has flown freely. The unpiloted vehicle's supersonic combustion ramjet, or scramjet, ignited as planned and operated for the duration of its hydrogen fuel supply, which lasted about 10 seconds. The X-43A reached its test speed of Mach 7.